Our Chief Conductor, Matthias Bamert set a theme for 2019 Subscription Concert Series, “What composers do to other composers...” The Sapporo Symphony Orchestra has asked each conductor participating in this series to suggest the repertoire which would fit to this theme. For this Subscription, Bamert has selected orchestrated version of Brahms Piano Concert No. 1 (orchestrated by Schoenberg). According to Schoenberg, he arranged the work so that every note that Brahms had composed could be heard by the listeners. It is one of the masterpieces with overwhelming power of orchestra. 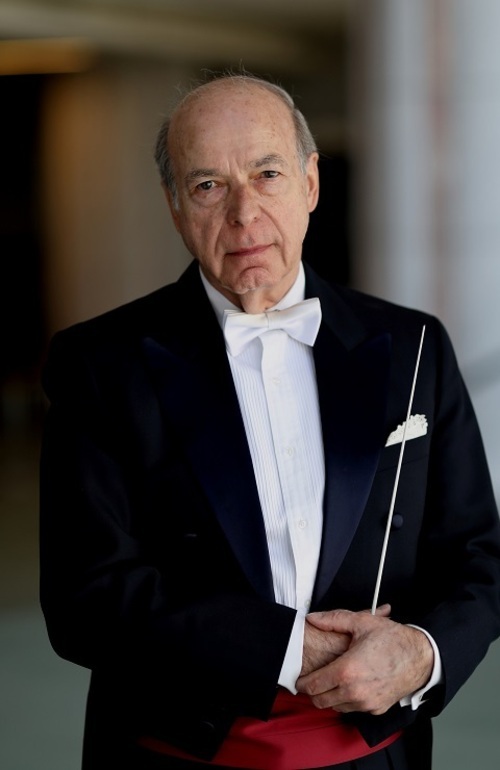 Other two works for this concert follow Barmert’s announcement during his inauguration: introducing works by Japanese composers and young artists. “Death and Resurrection” by Takemitsu is his last work for the orchestra, written from the film “Black Rain” by Masuji Ibuse. It must have a significant meaning to present “Death and Resurrection” and pray for peace in August, the month that suffered with the atomic bombing. And Brahms Double Concerto for violin and cello; we will welcome two young and talented artists, Sunao Goko, violin and Gen Yokosaka, cello. The winner of the Tibor Varga International Violin competition, Switzerland in August 2013, Sunao Goko is one of the sought-after violinists in the world today. 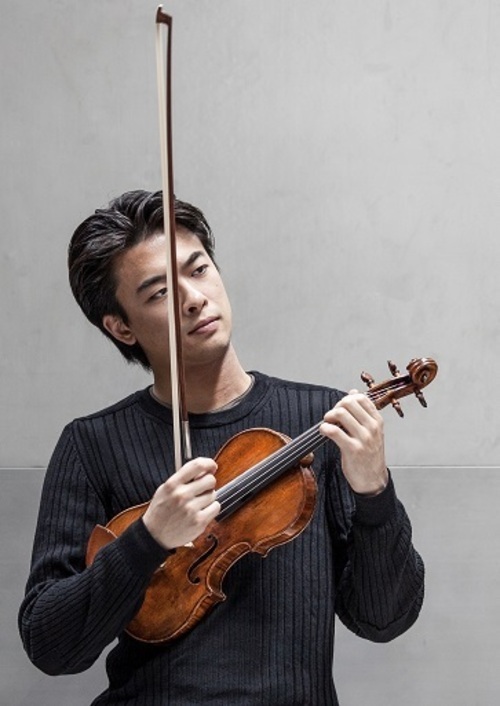 Born in Tagajo, Miyagi in 1993, Goko is the youngest Junior Prize winner of the 11th Yehudi Menuhin International Competition for Young Violinists. 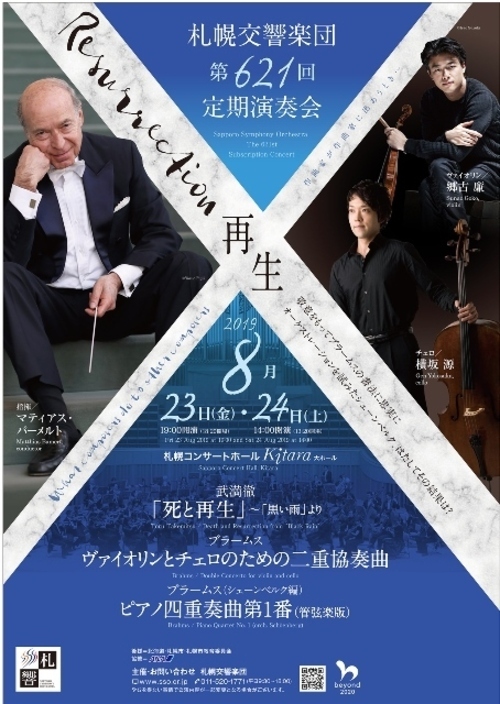 Since his debut in December 2007, Goko is invited to New Japan Philharmonic, Yomiuri Nippon Symphony Orchestra, Tokyo Symphony Orchestra, Tokyo Philharmonic, Japan Philharmonic, Osaka Philharmonic, Nagoya Philharmonic, Sendai Philharmonic, Sapporo Symphony Orchestra, Ensemble Kanazawa; under the baton of Gerhard Bosse, Kazuyoshi Akiyama, Michiyoshi Inoue, Tadaaki Otaka, Kazuhiro Koizumi, Toshiyuki Kamioka, Tatsuya Shimono, Kazuki Yamada, and Kentaro Kawase. For years 2011, 2012 and 2014, Goko was invited to the Saito Kinen Festival Matsumoto and appeared in “L'Histoire du soldat” composed by Stravinsky. He is also invited to Spring Festival in Tokyo, and La Folle Journée au JAPON. From 2017 and for 3 years, he is working on the Complete Series of Beethoven Violin Concerti. Goko currently lives in Vienna and his appearance in Europe is increasing, visiting German, France, Spain, Switzerland, Italy, Czech and many more. He studied his violin under Mami Teshigawara, Gerhard Bosse, Akiko Tatsumi and Pavel Vernikov. Goko’s recording is first released in 2014 from EXTON label with unaccompanied works. In 2015, he released Brahms Violin Sonata from nascor label and in 2017 November Bach and Bartok works from EXTON label. He plays Antonio Stradivari（Banat）lent by a private owner. Born in 1986, Gen Yokosaka began to play the cello at the age 4 and studied with Katsuro Washio and Hakuro Mori at the Toho School of Music as well as taking further lessons with David Geringas and Jian Wang at the Ishikawa Music Academy. 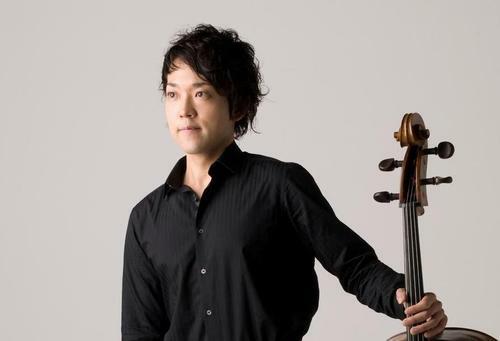 Gen quickly became known as the most promising cellist of his generation in his native Japan after being awarded the top prize in the string section of the All Japan Classical Music Competition at 12 years old. He went on to win numerous competitions including, at 15, the 2002 Viva Hall Cello Competition in 2002 of which he is the youngest ever winner. Gen Yokosaka has performed with such conductors as Seiji Ozawa, Kazuyoshi Akiyama, Naoto Otomo, Ken Takaseki, Kenichiro Kobayashi and Daisuke Soga with orchestras including the Yomiuri Symphony, New Japan Philharmonic, Japan Philharmonic, Tokyo Symphony and Osaka Philharmonic. He has had both recitals and concerto performances broadcast on national TV (NHK and TV Asahi). A dedicated chamber musician, Gen was invited to perform in “Project Q,” Casals Halls’ Complete Beethoven String Quartet series in 2001, also performed Popper’s “Requiem for 3 Cellos and Piano,” Op. 66 with Nobuko Yamazaki and Ryosuke Hori. The pianists he played with include such renowned artists as Kei Ito and Miyuki Washimiya. In 2005 Gen performed in La Folle journée au Japon and took part Pierre Boulez’ Lucerne Festival Academy. In the same year he was presented the Idemitsu Music Award. Gen Yokosaka studied at the Musikhochschule Stuttgart and Hochschule für Musik Freiburg. Gen Yokosaka plays a 1710 cello by Pietro Giacomo Rogeri kindly loaned by the Suntory Foundation.